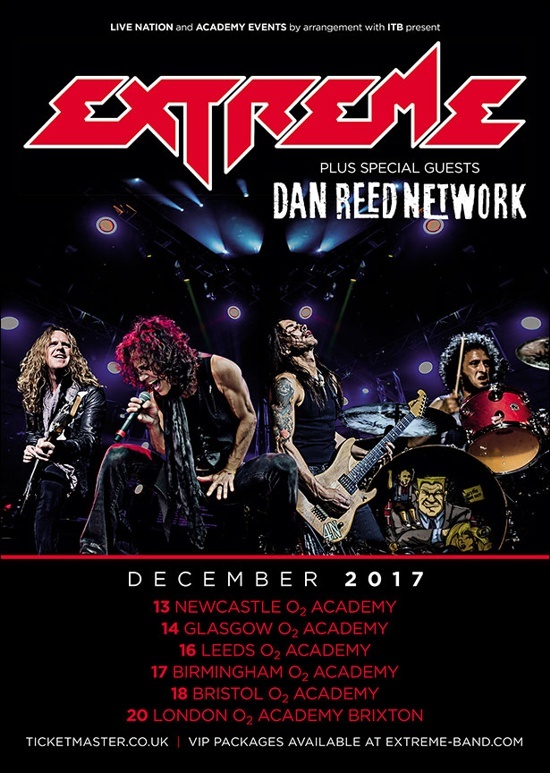 Dan Reed Network are pleased to confirm they will be special guest on EXTREME's December 2017 UK tour. The O2 Pre-sale starts Wednesday, 2 August at 9am, followed by a Live Nation Pre-sale on Thursday 3 August at 9am. Tickets go on sale to the general public from livenation.co.uk and www.ticketmaster.co.uk on Friday 4 August at 9am. All cylinders are furiously firing, Dan Reed Network are back all guns blazing. With the recent release of their critically acclaimed album "Fight Another Day" safely in their pockets, the band have indulged Europe and the States in a fiery return to the touring circuit. 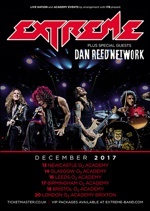 "DRN is honoured to be touring with EXTREME this December in the UK," says Dan Reed. "The funk rock scene of the late 80's early 90's was an exciting, inventive era in the music scene and to be sharing the stage with one of a handful of bands that championed that movement will be nothing but good times on stage for us, and a raucous experience for the audience. This tour promises to be an adrenaline fuelled evening of soaring melodies, infectious grooves and a party atmosphere that we in the band are truly excited about being a part of, and we are tremendously grateful to be on the road with such a talented and innovative band. Time to funk it up big time!"